Philip Alexius de László was a painter born in Budapest in 1869. He became one of the most prolific and famous artists of the 19th and 20th centuries, painting portraits of the powerful, rich and famous of his time, from Kings and Queens to Presidents and Indian chiefs, from musicians to military heroes and even the Pope! He received so many commissions that Lord Selborne, talking about the portraitist asked: “Has any one painter ever before painted so many interesting and historical personages?”. In 1907 the painter moved to England. 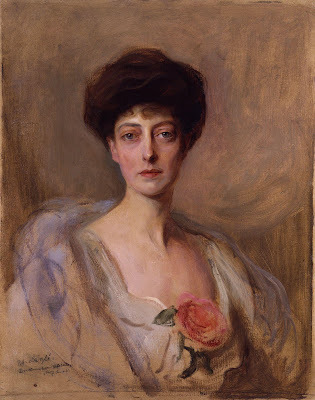 That year he was summoned to Buckingham Palace to paint the portrait of Princess Victoria, King Edward VII’s daughter. One day, the king was present during a sitting and noticed something unusual. On the opposite side of the board De Laszlo was painting on was the portrait of a man he knew! De Laszlo was horrified. He couldn’t believe he had been so careless! But the King was amused and said that future historians, when examining the double portrait, would probably assume his daughter and the man had been in love but he had kept them apart! “At least they had the gratification of being on the same board”, concluded the King!